The story of Gokarna is found in the Padma Purana. The story has it that there lived a learned person named Atmadeva on the banks of Tungabhadra River who followed Dharma. He was rich and scholarly but his wife, Dhundhuli, was ill-tempered and quarrelsome. The couple did not have any child even after years of marriage. Atmadeva decided to perform intense penance to have a child. While on his way to the forest, he met an ascetic and told him about his problems in life and his decision to do penance to fulfill the desire of having a child. The ascetic had the capacity to see past, present and future. He knew that Atmadeva would not have a child. But still he gave Atmadeva a magic fruit for his wife to eat. Atmadeva’s wife was not interested in having a child as she considered children as burden. She was not ready to spoil her beauty and health. To keep away from the troublesome life of raising a child, she gave the fruit to the cow in the house. In due course, the cow gave birth to a baby that had ears like a cow, and the boy came to be known as Gokarna. Atmadeva’s wife, unhappy with Gokarna, adopted her sister’s son Dhundhukari. Dhundhukari grew up into a wicked man under the influence of Dhundhuli, wife of Atmadeva. He depended on thieving and criminal acts for subsistence and wasted wealth on prostitutes. He was killed by the soldiers of the king and prostitutes. They burned him alive. As a result of such a brutal death, Dhundhukari became a evil spirit and roamed around the area. Gokarna, who had gone on pilgrimage, returned and found out about the horrific death of Dhundhukari. He performed the after death rites at Gaya. He then performed intense penance and propitiated Surya (sun god) to get Dhundhukari out of preta yoni. Surya asked Gokarna to narrate the stories from Bhagavad Purana to liberate the spirit from preta yoni. When this was performed, Dhundhukari was liberated. He got sin redemption and attained moksha. Gokarna continued narrating stories from the Srimad Bhagavad Purana to the people in the region. The presence of Gokarna made the place holy. Numerous temples were built in the region. The place soon came to be known as Gokarna. Gokarna is a small temple town on the western coast of India in the Kumta taluk of Uttara Kannada district of the state of Karnataka. The main temple in the town is Mahabaleshwar. 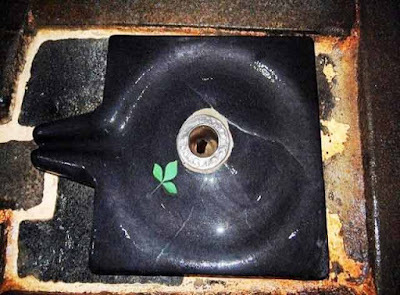 The temple is dedicated to Shiva and has what is called an atmalingam which is one of the most powerful lingams. The name Gokarna is made of two words, gau meaning cow and karna meaning ear, translating to cow’s ear. The reason for such a name is associated with its roots in Hinduism and also the geography of the place. According to geography, the reason for naming this place Gokarna is because it is at the confluence of two rivers Gangavati and Aghanashini and this looks like a cow’s ear. According to Hindu scriptures, Shiva was sent to Patala Loka (netherworld) by Brahma. He later emerged from the earth out a cow’s ear and that is why the name - Gokarna. Being a temple town, Gokarna has many other stories associated with it. It is mentioned in the Shrimad Bhagavata Purana. Hindu scriptures says that when Lord Parashurama, the sixth avatar of Lord Vishnu created Kerala, it was from Gokarna to Kanyakumari. Another story in Hinduism states that, Ravana was given Atmalinga to be taken to Lanka by Lord Shiva and instructed that it would stay permanently where it is first placed on the land. But Lord Ganesha came in the form of a boy and planted it in Gokarna while Ravana was performing rituals. He did this to stop Ravana and Lanka becoming invincible. Once placed Ravana could not remove the Atmalinga from ground, but he removed some pieces of the Linga and threw them in different directions. It resulted in his throwing the coverings of the Linga to Dhareshwara, Gunavanteshwara, Murudeshwara and Shejjeshwar temples. Ravana was unable to lift the linga from the ground again and called the shiva linga as Mahabala, one with great strength, and ever since, the linga is illustrious as Mahabaleshwara.